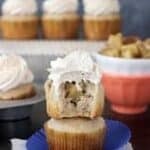 I have been making Apple Pie Cupcakes for the past couple of years; experimenting with different combinations of cupcakes, fillings and frosting. Well I finally found the perfect combination and it involves a Maple Swiss Meringue Buttercream. I am infatuated with maple syrup, real maple syrup, none of that Aunt Jemima stuff. Whenever I am running low on maple syrup, I just pick of the phone and ask my Dad to send me a fresh batch from Vermont. I am maple syrup spoiled. 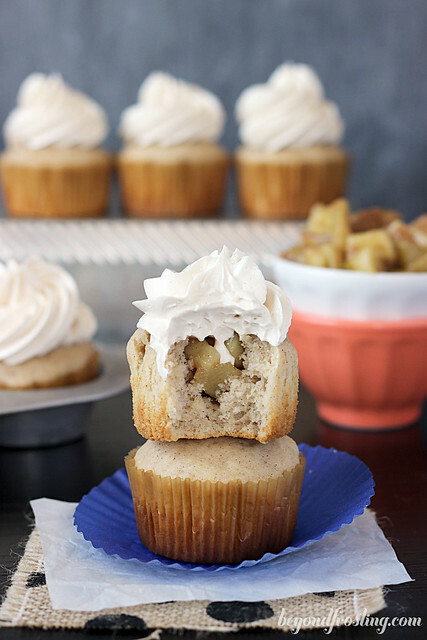 These cupcakes are filled with a fresh apple pie filling. Last weekend, I made so many apple desserts that I went through a Costco sized bag of apples. It was non stop apple pie filling all weekend. My apple pie filling is down right awesome I must say. I add a bit of maple syrup to my filling obviously and quite a bit of cinnamon. Then I slowly cook the apples on the stove top until soft. The cupcakes are a “doctored up” cake mix. Now before you roll your eyes, hear me out. I appreciate a GOOD homemade cupcake of course, but cake mixes with a few additions make for an amazing cupcake. I also use sour cream, which helps keep them soft and moist for a couple days. 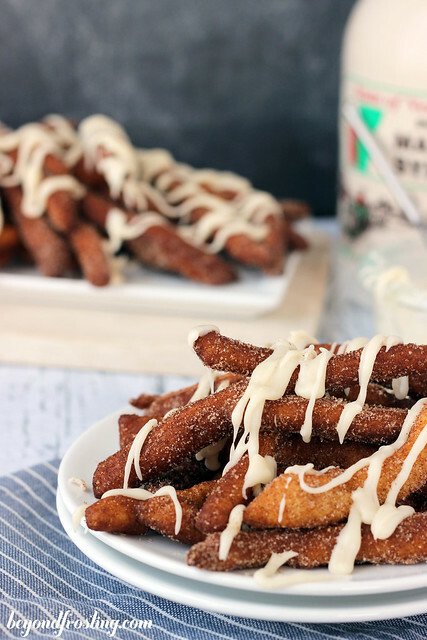 In addition, I use vanilla pudding mix for flavor purposes and lots of cinnamon. 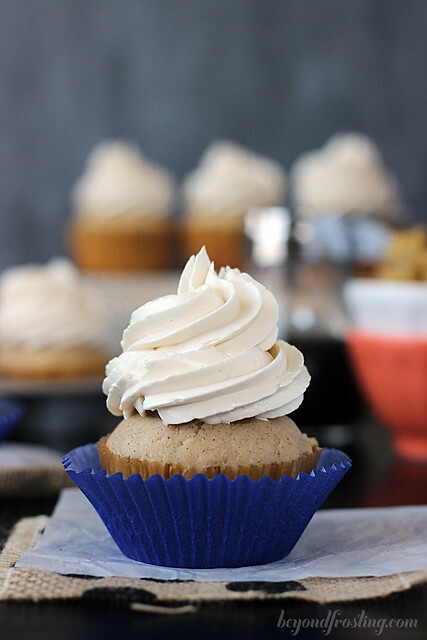 If you are looking for a homemade cupcake recipe for these, might I suggest this one. Once the cupcakes are cooled, you hollow them out and fill them with the apple pie filling. I use my Norpro Cupcake Corer. You can use a melon baller, a spoon or a knife, but I just LOVE the ease of my cupcake corer. 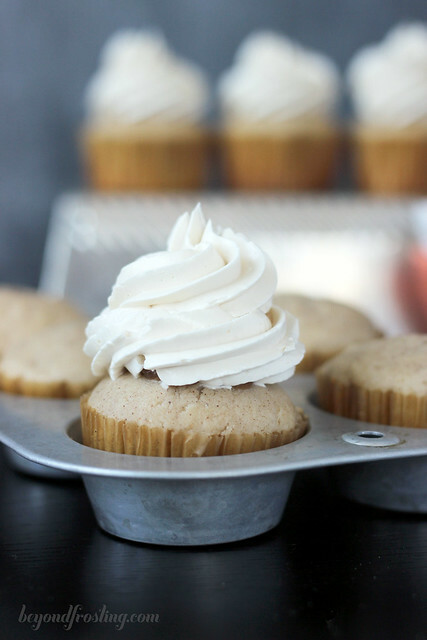 It makes it incredibly fast and easy for filling cupcakes. Now this frosting is where it’s at. This is a Swiss meringue buttercream, which is made from egg whites, granulated sugar and quite a bit of butter. This frosting can be intimidating for some, because you have to heat the egg whites and then beat them for what seems like forever. Before you attempt to make this, I highly suggest purchasing a candy thermometer. You can pick one up at Target for $10 or order it from Amazon, I use this Candy Thermometer . For this recipe, you need to heat the maple syrup in the microwave and then slowly add it to the mixing bowl. The results are a lightly sweetened frosting. It’s not an over baring maple flavor, which is what I like about it. When making Swiss meringue buttercream, it is important to use grease-free utensils like spatulas and glass storage containers. Glass doesn’t retain grease after washing. I keep a separate set of utensils for meringue based recipes. If you have never made a Swiss meringue buttercream, make sure you read through all my tips and tricks for how to make Swiss Meringue Buttercream first! It has all kinds of tips and tricks to help you along. The ingredients list is pretty long and there are a lot of instruction, but don’t be scared. 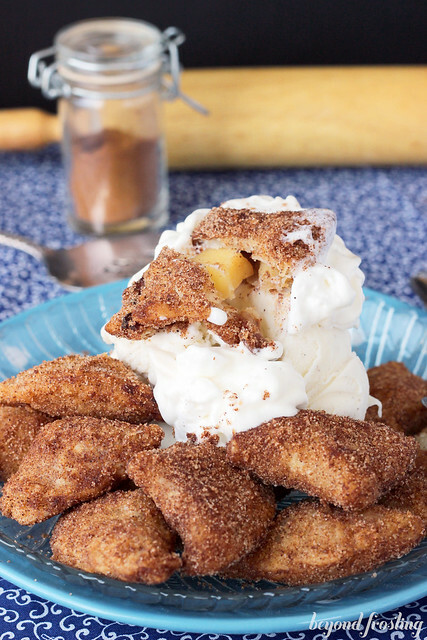 You can make these and the reward is worth it! I served these at work for a birthday last week and they got rave reviews. Cheers to apple season! 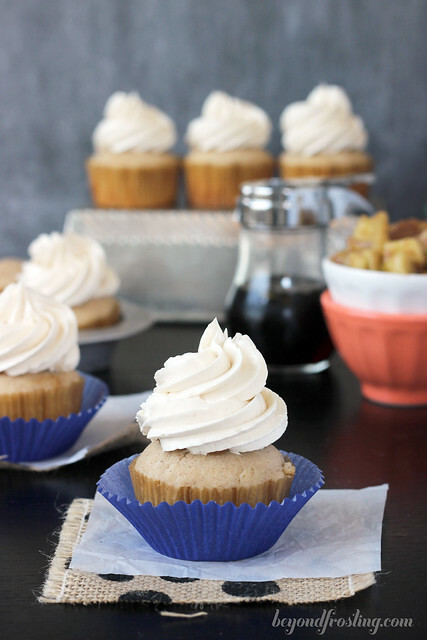 A cinnamon infused cupcake filled with apple pie and topped with maple Swiss meringue frosting. 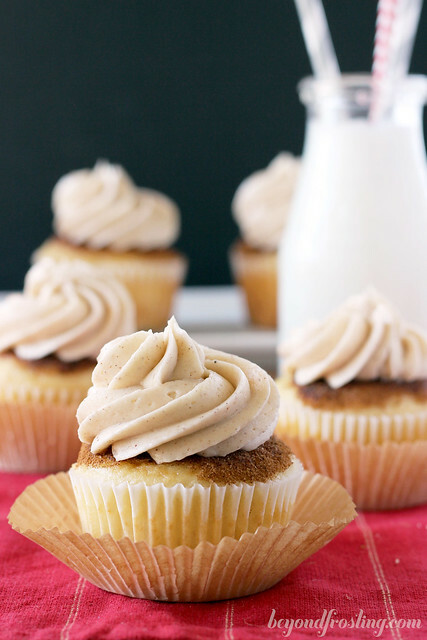 Combine vanilla cupcake mix with vanilla pudding mix and cinnamon. Add eggs, one at a time, beating well after each egg is added to ensure it is well mixed. Add milk, oil, sour cream and vanilla. Beat on medium speed until all ingredients are well combined. Use a spatula to scrap down the sides of the bowl and turn the batter over from the bottom. Fill cupcake liners 2/3 full. Bake at 350°F for 15-18 minutes until cupcake are done. You do not want the tops to turn brown. 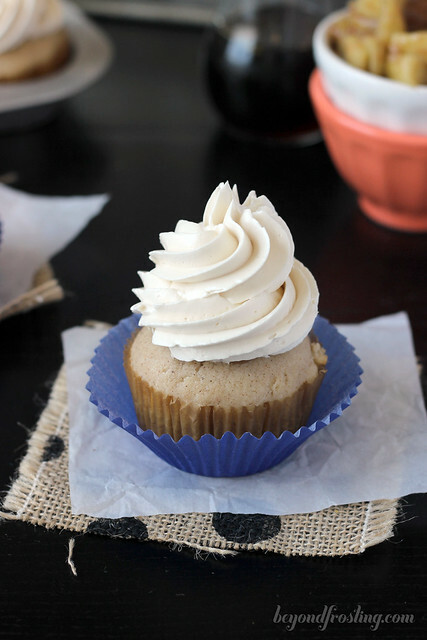 Check for doneness by inserting a toothpick in the middle of the cupcake. If the toothpick comes out clean, your cupcakes are done. Allow to cool completely. Add brown sugar, flour, maple syrup, cinnamon, apple pie spice over top of apples. Stir to mix ingredients. Heat apples on the stove over medium heat for 15-20 minutes until soft. Stir occasionally. Set aside and allow to cool. Remove butter from refrigerator and cut into cubes. Allow to sit for out for 20-30 minutes. Temper egg whites and sugar in a heat-proof bowl over a pot of simmering water on medium heat. You need just enough water to cover the bottom of the pot, about 1 inch. Heat the egg whites and sugar to 150°F, ensure the sugar as dissolved. !Make sure to stir constantly to avoid cooking the egg whites. After all the butter has been added, change to paddle attachment and continue beating on medium to allow all the air bubbles to escape. Beat for 2-3 minutes and then slowly add the maple syrup into the frosting. Beat for another 3-5 minutes until the frosting is smooth. Increase speed to high for the last 30 seconds. To assemble the cupcake, remove the middle of the cupcake, use a spoon to fill with apple pie filling and top with frosting. Frosting will make enough to frost 32-36 cupcakes. How long would this frosting hold up in the fridge or once piped?? Can it be frozen? Any tips on how to rewhip frosting if I have leftovers to use on another batch? When refrigerated, this will harden to a firm consistency due to the amount of butter. Before serving, you need to let it come to room temperature. I have not froze the frosting myself but if you store in an airtight container, you can rewhip it. 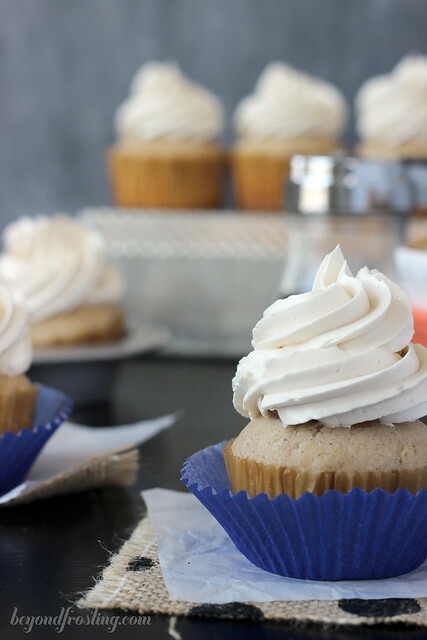 This is a great resource for Swiss Meringue Buttercream. There’s some notes in her recipe about refrigerating, freezing and rewhipping. These cupcakes are stunning. 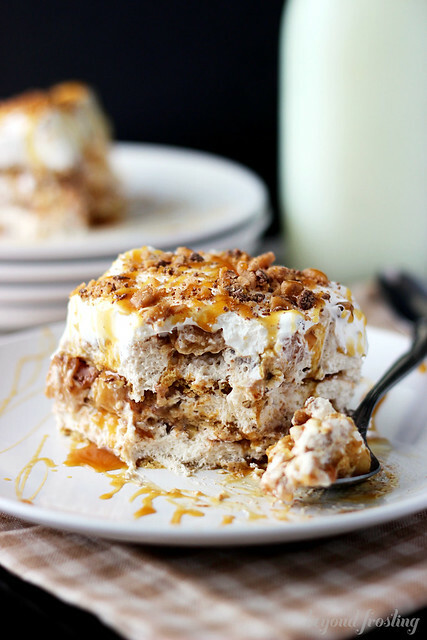 You could not have piped the frosting on more perfect, and apple pie filling ugh!! I want a cupcake or five now!! Thank you Elizabeth! I went crazy over these cupcakes! Amazing idea! 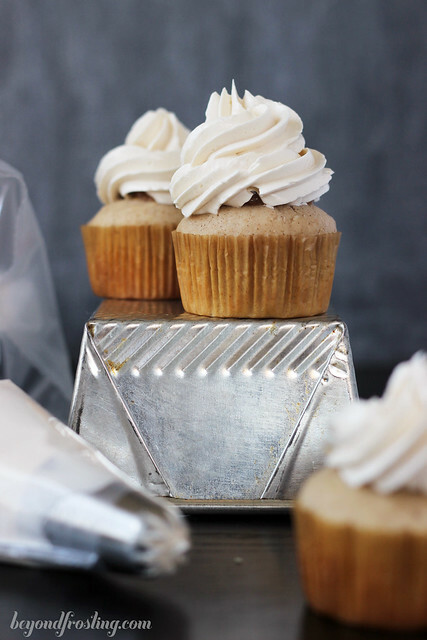 And look at that incredible white frosting… to die for! I love a good SMB especially with maple! These look like fabulous cupcakes!